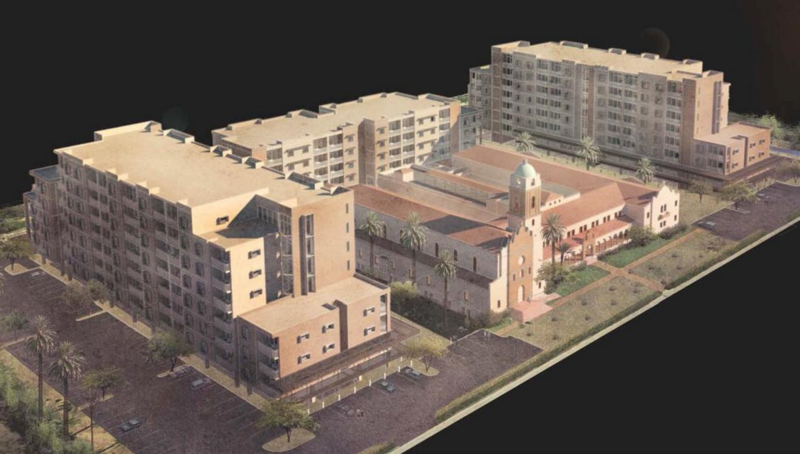 Urban University Interface.com | Preserving Tucson's core character by acknowledging and defining a new interface between downtown-university area development and surrounding neighborhoods. PRESERVATION THROUGH ATTRACTION! Of course, saving the monastery, makes the project thematic. That theme is either one of blending or clever contrast. This looks like a competitive theme of old vs new; like the Benedictine Monastery surrounded by medical dorms. The new forms are not clever, nevertheless, pleasant in and of themselves. In any case, the shear mass that surrounds the monastery can’t help but steal the show. Clever contrast or sensitive blending would be a bigger challenge. The architect could start by touching the new and old at the ground plane with a friendly gesture. By the way, when is the last time we celebrated our architectural heritage in new significant architecture? Here is an opportunity to revere a Tucson treasure. Here are (3) links to current critical documents in downloadable PDF. Mayor and Council will likely vote to defer approval of the 74M 30% RTA plan for further study to correct serious problems on April 19, 5:30 @ M&C chambers. Check for meeting location. Under desperate inside pressure, they can also vote to move forward on the flawed plan. Check out the above links. The plan on the table is a downtown killer. The RTA is pushing an “effective” 8 lane plan that disguises itself as a 6 lane context sensitive plan. The 16 bus pullouts split over both sides of the short stretch invalidate outside lanes 5 & 6 as “bus” lanes. So, why does the RTA want 6 traffic lanes of in & out of downtown at the end of Broadway? This moves more traffic to a bottleneck @ 4th Avenue & Congress. What about the “downtown congestion stigma”? The west end of the Broadway Corridor is an opportunity we need to jump on, hard. An intentional urban corridor for both cars and pedestrians can be part of the destination; a collection promenade; a narrow continuous rubber tired shuttle system to all points with 3 minute leads. It is an obvious extension of the downtown business explosion we see before us. We can coat tail on to this economic phenomena; making a worthy urban destination more accessible to all. Think about the 16th St. Denver Mall and then imagine an urban concept, even greater without compromise to the vehicular access we currently enjoy; but vastly smarter than the blinded 75M 30% plan. It has been said before, that in assuring the positive outcome of good deal. You have to be able to walk. The question here, is should we walk? We didn’t do it before and we suffer the consequences over and over. Here a $74M over-design makes no sense in the face of a crippling city budget deficit. Tucson needs to walk away from what’s on the table and figure out how to keep valuable staff employed and save tax revenue. Here is some good reasoning for walking on the deal currently on the table. Read this clickable excellent editorial by Bob Vint in the Daily Star. Broadway renovation plan needs a redo This a deal that many city leaders want to walk away from but has its argument as well. Please view Tim Steller’s point of view which is not supported by this blog: City’s New Broadway Widening….